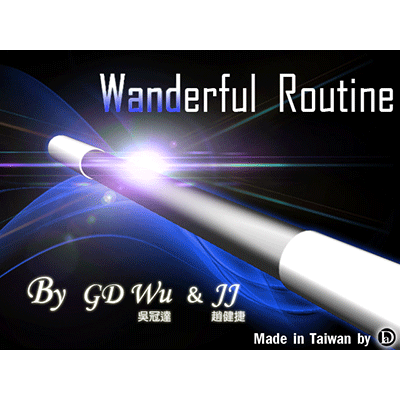 Wanderful Routine, the latest creative magic product, is designed cooperatively by GD Wu and JJ . GD Wu is a magic super idol of Taiwan and JJ is from his RD team. This product is made of excellent wood, not plastic like other wands. The wooden touch can facilitate finger control and increase a solid feeling. You can carry it easily and perform on stage without any complicated setting in advance. It will be definitely be a great addition to your personal or business show! Through the simple, visual-teaching instructions on the DVD, you can easily perform this stunning effect including changing colors, splitting, lengthening, or coming out with a pigeon, just like the demo clip. You can even add your own ideas and/or style to create a more amazing and fabulous magic show! Comes complete with special wooden wands and instruction link.